William, or Wim as he is affectionately known, was born in 1927, in New York, USA. The “Wim” comes from the fact that his parents were Dutch. They were also in the diplomatic service, which meant he travelled widely in his younger years and, as an only child, drawing became his solace. These worldwide influences can be seen in his bird and flower studies and his evocative Australian landscapes which possess an almost oriental lyrical beauty of understated line and colour. Boissevain studied at L'Academie des Beaux Arts, Paris, and at the Central School of Arts and Crafts, London. 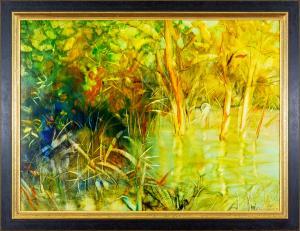 In 1949 he came with his family to Australia where he has lived and worked ever since, developing an international reputation as one of our most distinguished artists. In the early years, portraiture became an important money earner and even while teaching, he began to gain commendation for his skill. In 1964 he exhibited at the Skinner Gallery and his career escalated. The decorative style of his approach, his eye for line and form, and a strong sense of colour soon made his work universally popular. In 1978 he was awarded an Order of the British Empire (OBE) for his services to the advancement of art. 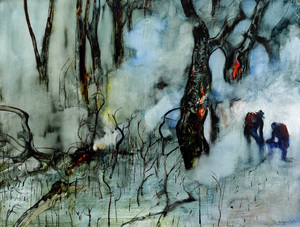 Boissevain depicts the beauty of nature in all forms - flowers, fruit, people, animals and Australian landscapes, employing a strong realist style and distinctive technique which layers delicate oil washes over expressive brush drawing. His oil washed nudes are skilful and sensitive studies of the female figure in repose. 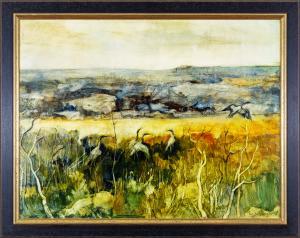 Working from his studio in the Darling Ranges near Perth, W.A. Wim Boissevain has created paintings that hang in galleries and major collections throughout the world.